Connect advocates to lawmakers in Congress and all 50 states. Post regulatory comments. Integrates seamlessly into your website. Get started in minutes. 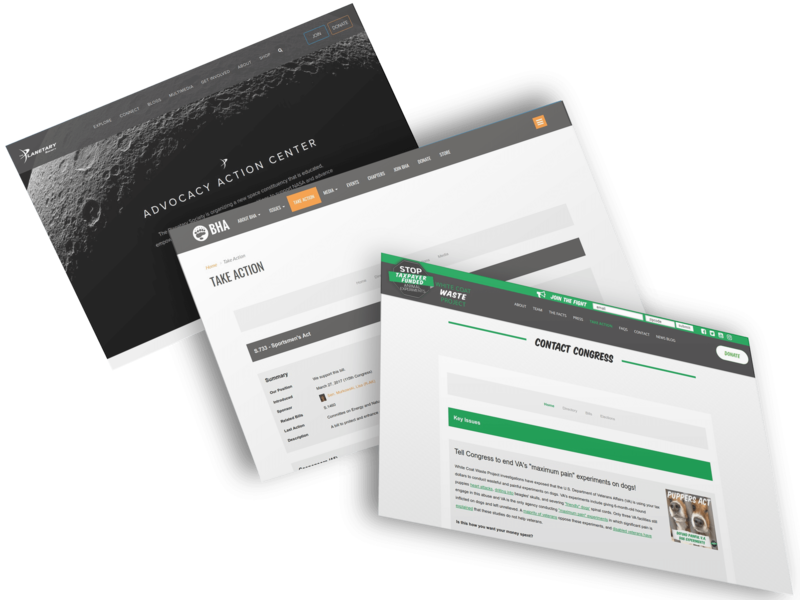 Achieve your advocacy goals with multiple campaign types at your disposal. Advocates can send an email, fax or letter to their legislators. Advocates can Tweet lawmakers directly using our Twitter integration. Facilitate posting a comment to a legislator’s wall. Advocates can share with friends at the same time. Advocates can call legislators manually or via patch-through calling. Talking points and a follow-up survey supported. Mobilize your advocates to sign a petition. See progress towards your target. Out of the box signature reports. Allow advocates to easily post comments on regulatory forms for issues important to your organization. Advocates can send a pre-crafted message to local media based on their zip code. Combine campaign types into a single easy-to-use action that meets your goals. 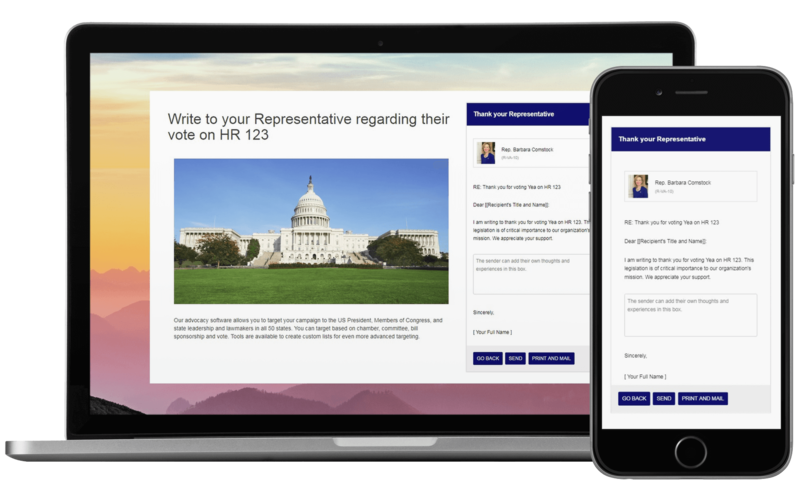 Target messages based on vote position, bill cosponsorship, committee, custom list and more. When your advocate enters their address, they get the appropriate message based on your targeting. Use as many rotating message and subject line combinations as you would like to make your campaign as effective as possible. Our legislative action center provides an opportunity for you to educate your supporters. You can share legislation that is important to the organization. A directory is available to your advocates to learn more about their legislators and legislatures. 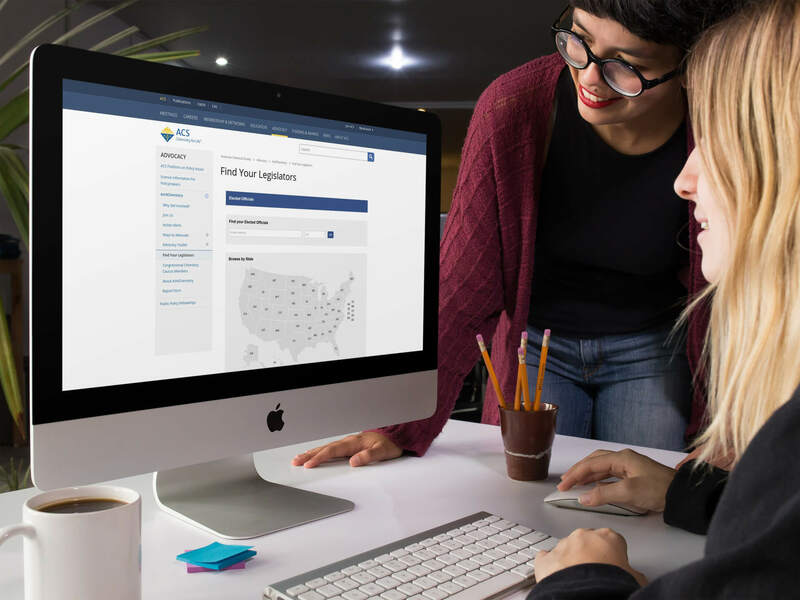 Mobilize visitors during election season with information about upcoming elections and voter registration tools. 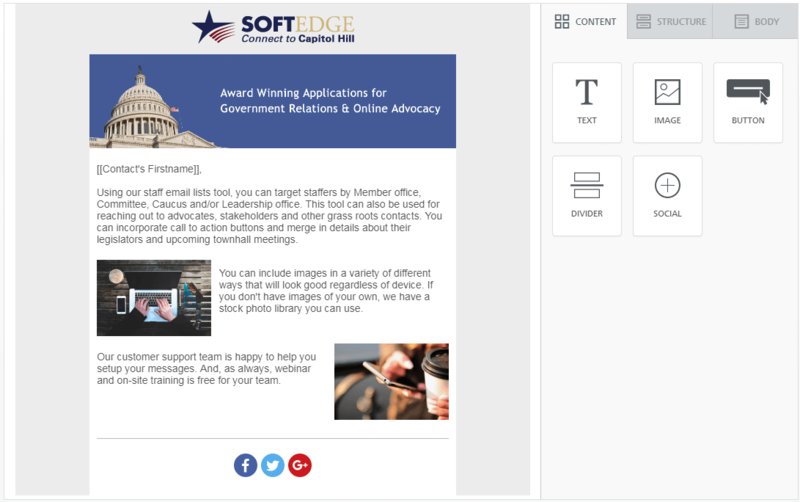 Reach out to your advocates with modern, responsive emails and text messages. Collect information about their relationships with legislators. Use magic links to automatically fill in their information when they take action. Use A/B testing to engage more effectively. Place your site in event mode so that people can easily take action during annual meetings or other events. Show an activity map that updates in real-time as people take action. Advocates can text a custom keyword of your choice to a short code and receive a call to action. See how our advocacy software can change the way you work.